For mental-health professionals and students. Mindfulness is an approach that allows both clients and therapists to relate to themselves and their lives with wisdom and equanimity. The role and usefulness of mindfulness-based interventions in clinical practice has been the subject of much research and discussion. Less understood is the role of a personal mindfulness practice for clinicians. If we take the view that mindfulness is more than a prescriptive technique, and is a valid way of life, then the potential transformative aspect of this way of being for the clinician is a significant factor in the delivery of mindfulness-based approaches. This 2-day training for professionals interested in the interface of mindfulness in clinical treatment will be both didactic and experiential. We will discuss the structure and delivery of a Mindfulness-Based Cognitive Therapy (MBCT) program and practice various MBCT skills with an emphasis on their application to cases of preventing depression relapse. The workshop will also include time for personal mindfulness practice. Recommended reading Zindel V. Segal, J. 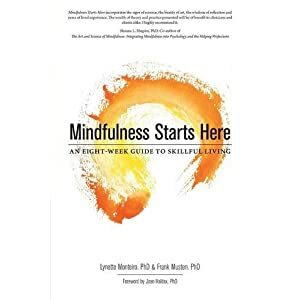 Mark G. Williams, and John Teasdale, Mindfulness-Based Cognitive Therapy for Depression (Guilford Press) and Mark Williams, John Teasdale, Zindel Segal, and Jon Kabat-Zinn, The Mindful Way through Depression (Guilford Press).